The Power Paver SF-2700 was recognized by Roads & Bridges Magazine as a 2015 Contractor’s Choice Award winner. 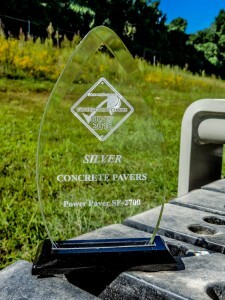 Each year, the readers of Roads & Bridges vote for equipment in specific categories; the SF-2700 won the Silver award in the Concrete Pavers category for the second year in a row. The SF-2700 from Power Pavers is a popular two-track paver designed to pave between 12′ (3.65 m) and 27′ (8.23 m) wide. It is ideal for residential streets, street rehabilitation, and overlay work. Its low profile and narrow side clearance simplifies rehab work on cramped city streets.